"When the twin towers collapsed... My lungs filled with air and I breathed in relief, as I had never breathed before." Since the attacks on September 11, 2001, The Middle East Media Research Institute has monitored, translated, and recorded what was said in the Arab and Iranian press about that day. Prominent journalists, members of academia, leading religious figures, and even Arab government officials helped shape conspiracies about what "really" happened. The carefully documented collection is now available as a PDF and includes a compilation of articles and editorials from the mainstream Arabic and Persian language press, as well as transcripts from television programs. 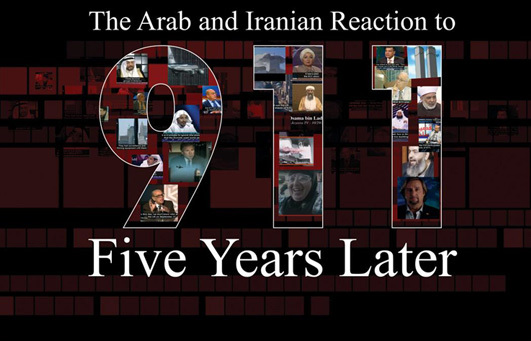 A documentary film about the Arab and Iranian reaction to 9/11 incorporates footage from various TV and satellite stations in the Middle East. It was made with Interface Media Group and narrated by acclaimed actor Ron Silver. If you are interested in supporting similar projects in the future, email us.